Add a comma after recon team. I also recommend getting rid of the ellipsis at the end, because that sentence doesn’t actually trail off, incomplete, and only in book blurbs and such should an ellipsis be used just to create fake a sense of dramatic tension or whatever. The first group sent to colonize Mars goes silent after nine days. As part of the recon team, you are sent to find out what’s happened to them. 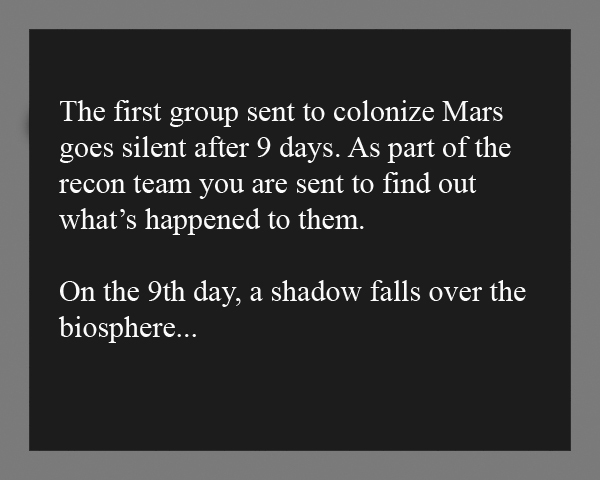 On the ninth day, a shadow falls over the surface of the planet. For several years, I’ve been putting my uncanny knack for grammar and punctuation, along with an eclectic mental collection of facts, to good use as a Wielder of the Red Pen of Doom (editor). I'm physically disabled, and I currently live with my smugly good-looking twin Paul, who writes military science fiction and refuses to talk about his military service because he can’t. Sometimes Paul and I collaborate on stories, and sometimes I just edit whatever he writes. It's worked out rather well so far. My list of non-writing-related jobs from the past includes librarian, art model, high school teacher, science lab gofer… Although I have no spouse or offspring to tell you about, I do have six cats. (The preferred term is "Insane Cat Gentleman.") I currently spend my time blogging, reading, editing, and fending off cats who like my desk better than my twin’s. This entry was posted in Writing Glitches and tagged glitch, science. Bookmark the permalink.